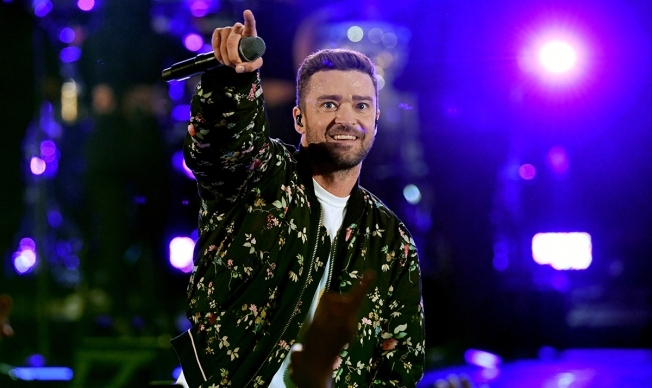 Justin Timberlake performs onstage during the 2018 iHeartRadio Music Festival at T-Mobile Arena on September 22, 2018 in Las Vegas, Nevada. He had to postpone the rest of his current tour. It's Jonah Hill to the rescue. After Justin Timberlake notified fans he would have to postpone the rest of his 2018 Man of the Woods Tour dates, the "21 Jump Street" star offered to fill in for the singer. "Hey Guys, I'm sure you have heard that I've had to postpone several tour dates due to bruised vocal cords," he wrote via a shared note on Instagram. "My vocal cords are healing, but they are not all the way back to normal yet, so my doctors want me to continue to rest my voice. They have asked me to hold off on singing until next month. I'm really sorry, I want to be back on the stage and I am doing all I can to get there quickly. Thank you for understanding--I see all of your posts and I appreciate the support and the love. I look forward to coming back stronger than I was before. More to come on rescheduled dates. " The former 'N Sync member then thanked the "Superbad" star for offering to pitch in. "@jonahhill well guys...I was gonna wait for my next post to unleash this wonderful news. BUT...you heard it here first," Timberlake replied back. "Jonah crushes 'Mirrors' too so you guys are gonna LOVE IT. Thanks man!" The Hurt Locker" actor wrote: "And let's not forget your killer dance moves Jonah, that may rival JT's..."
"Let's go on a silent retreat together JT," "The Daily Show" host quipped. This wasn't the first time Timberlake has had to postpone one of his concerts. He also pushed back his show at the Los Angeles Staples Center in November, as well as his performances at New York's Madison Square Garden and Keybank Center in October. He postponed his show at the Tacoma Dome in Washington in November as well.